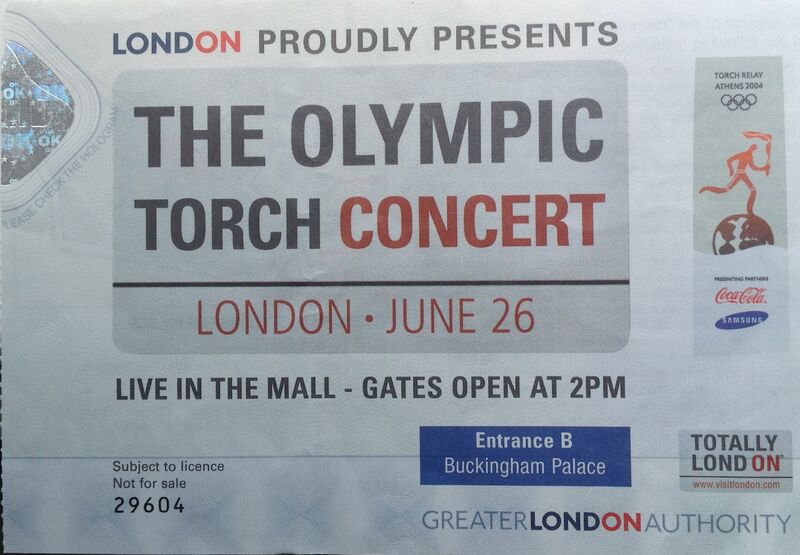 Tickets were given away free, through a ballot, for this concert to mark the arrival of the Olympic Torch in London in 2004. The publicity at the time announced: “As the Olympics draw closer, London will host the Olympic Torch Relay and we have tickets to give away for the Olympic Torch Concert. It will be a landmark event for London and the UK as the torch is carried though 11 London boroughs on Saturday, 26 June. The Mall, for the first time, will become a gigantic open-air venue for 70,000 people, linking sport and music. Rock legend Rod Stewart will headline with James Brown and many other music stars such as Jamelia and Emma Bunton will also be performing in celebration of the Olympic flame coming to London” (BBC, 2004). David Campbell, chief executive of Visit London, said: “We are enormously proud to be associated with the Olympic flame’s visit to London, and are delighted at the support we have been given by all the artists for what will be a spectacular concert and day of entertainment. Visit London wanted to stage an event that encompassed the ethos of the Olympic ideal, bringing it to the people in one of the world’s most famous capital cities. We are confident that the Olympic Torch Concert and all the events on 26 June will do just that.” This was the first time the Olympic torch had come to Britain since 1948. 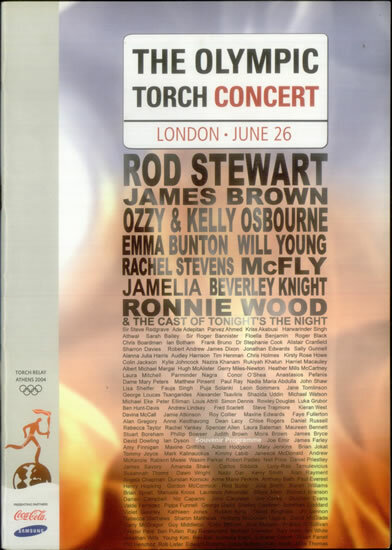 The full line-up of the concert was: Rod Stewart, Ozzy & Kelly Osbourne, James Brown, Will Young, Emma Bunton, Beverley Knight, Jamelia, McFly, Rachel Stevens, Razorlight. Marie and I were lucky enough to score a couple of tickets in the ballot so we went to London for the weekend for this special event. We arrived early, but the place was completely packed, with the stage right down the bottom of The Mall. It was impossible to get anywhere near the stage, but video screens had bee erected along the length of The Mall to show the concert and the progress of the Olympic torch as it was carried through London boroughs by 140 torchbearers. Sir Roger Bannister, 75 at the time, and the first man to break the four-minute mile in 1954, started the relay and brought it to a close by running up the centre of The Mall onto the stage. Highlights of the concert were Ozzy and Kelly singing “Changes”, James Brown and Will Young dueting on “Papa’s got a brand new bag” and Rod Stewart’s short three song set, which featured the cast from “Tonight’s The Night” (a big West End success at the time) on “Sailing” and “Rhythm of my heart”. But more importantly the concert also featured Rod with his old Faces mate Ronnie Wood on guitar for “Stay With Me”. You can see it below on YouTube. We are right at the back of the crowd watching a screen 😦 We probably would have had a better view watching it on TV, but the atmosphere in London was great 🙂 . Rod’s performance with Ronnie Wood made the day, and the trip to London, worthwhile for me. It was great to see the two of them performing together again, even it was only for a few moments, and it brought back many happy memories.